The Sherman was the most widely used Allied tank of World War II and was built in larger numbers than all German tanks combined. There was also a huge number of variants, powered by different engines, and manufactured with different types of hulls and turrets. 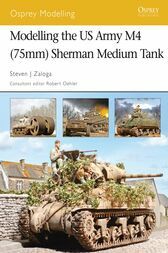 This book presents an expert guide to modelling the 75mm gun versions used by the US Army in the ETO, in 1/35 and 1/48 scale. The projects featured include an early M4A1 from Operation Husky (July 1943), an intermediate M4 during Operation Cobra (August 1944), an M4 mine-roller in the Ardennes (January 1945), and a M4A3 during Operation Grenade (February 1945). Steve Zaloga has written numerous book on tank development and military history including many on US Army armored vehicles and tank units of World War II. He has been modeling for many years, and has won numerous prizes at IPMS, AMPS, and other hobby conventions. He has written extensively on armor modeling including previous books in this series, as well as many articles in IPMS Journal, FineScale Modeler, Flight Plan and other magazines. He writes regularly for Military Modelling magazine and has also served as a moderator on the popular armor modeling website, Missing Lynx.